The Tenth Doctor used a Chameleon Arch to change himself into the human John Smith to elude the Family of Blood. You can craft a fob watch to change your self from a Time Lord in a regular player (a Steve — albiet with a random name). 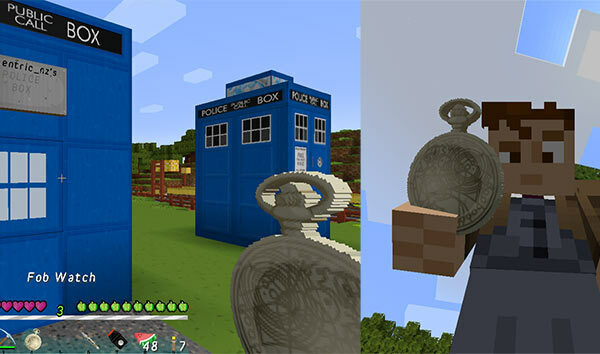 To see the custom fob watch texture you need to use the TARDIS-MCP resource pack, and an MCPatcher modded client. To use the Chameleon Arch feature, the server must have LibsDisguises installed. Players must have the tardis.chameleonarch permission. Once you have crafted the fob watch, you can put it to use! When ‘de-fobbing’ your Time Lord inventory and armour is restored. If configured (see below), a player may lose both ‘fobbed’ and time Lord inventories when they die. If you log off while ‘fobbed’ the amount of time you have been ‘fobbed’ for is recorded, when you log back in you will still need to meet the minimum time requirement. There are two commands associated with ‘fobbing’. Note: command usage is still logged with the player’s real name. Server admins can change the Chameleon Arch options.